WINNER OF THE FLAHERTY-DUNNAN FIRST NOVEL PRIZEFire Support Base Matterhorn: a fortress carved out of the grey-green mountain jungle. Cold monsoon clouds wreath its mile-high summit, concealing a battery of 105-mm howitzers surrounded by deep bunkers, carefully constructed fields of fire and the 180 marines of Bravo Company. Just three kilometres from Laos and two from North Vietnam, there is no more isolated outpost of America's increasingly desperate war in Vietnam. 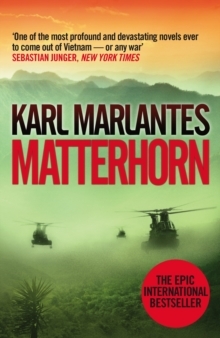 Second Lieutenant Waino Mellas, 21 years old and just a few days into his 13-month tour, has barely arrived at Matterhorn before Bravo Company is ordered to abandon their mountain and sent deep in-country in pursuit of a North Vietnamese Army unit of unknown size. Beyond the relative safety of the perimeter wire, Mellas will face disease, starvation, leeches, tigers and an almost invisible enemy. Beneath the endless jungle canopy, Bravo Company will confront competing ambitions, duplicitous officers and simmering racial tensions.